Do pipelines impact property value? If we are going to access private property as part of any maintenance activity, our personnel will normally attempt to contact the landowners/residents prior to entering the property and advise them of the nature of the company’s visit. We do however conduct unannounced routine activities such as regular mowing, spraying, and inspection activity on the right-of-way throughout the year that should not impact private property. A pipeline right-of-way is the strip of land over a pipeline. A right-of-way agreement between a pipeline company and property owner is called an easement. Easements provide pipeline companies with permanent, limited interest to the land to enable the company to operate, test, inspect, maintain and protect their pipelines. Although agreements may vary, pipeline companies’ rights-of-way generally extend 25 feet from each side of the pipeline unless specified. In many areas it is easy to distinguish where pipelines are because of the cleared corridor known as the right-of-way where pipelines will be located. Since pipelines are buried underground, pipeline companies use line markers to indicate the approximate location of pipelines. The markers are placed where pipelines intersect streets, railroads, rivers and heavily congested areas. Markers indicate the general, not exact, location of a pipeline, but do not indicate how deep the pipeline is buried, or how many lines are in the area. Pipelines do not necessarily follow a straight course between two markers. Never rely solely on the presence or absence of pipeline markers. 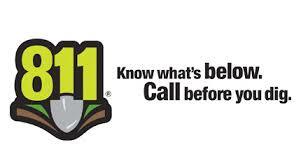 Always call 811 or your state’s One Call notification service before digging. Why not co-locate the pipeline along existing rights of way? Existing rights of way may not go in the direction the pipeline needs to go. Following existing rights-of-way might require additional easements because the width of the existing right-of-way may not be wide enough to for another pipeline. The terrain might be unsuitable for a pipeline or the environmental conditions may have changed from the time the original right-of-way was established. The Federal Energy Regulatory Commission (FERC) regulates issues concerning pipeline siting, pipeline capacity, natural gas quality requirements, and gas transportation rates. The U.S. Environmental Protection Agency (EPA) in conjunction with the state and local departments of environment or conservation districts provide erosion and sediment control approvals and inspections. The Federal Energy Regulatory Commission (FERC) has jurisdiction over the siting of natural gas pipeline facilities. State and local agencies are asked to be part of the siting approval process. We place a strong emphasis on being part of the host community, so we work closely with local officials on siting and construction issues. What are my rights as a landowner with respect to using the land where the pipeline is buried? Can I build or dig in the pipeline right-of-way? Pipeline rights-of-way must be kept free from obstructions. If a pipeline crosses your property, do not plant trees or high shrubs on the right-of-way. Also, do not dig, store or place anything on or near the right-of-way without first having pipeline company personnel locate and mark the pipeline and explain the company’s requirements for your particular location. Can dirt bikes and ATVs/four-wheelers damage pipelines by driving on the rights-of-way? Is this a security risk? As a policy, we do not approve of the use of the pipeline rights-of-way as a vehicular trail. Such vehicles can damage the earthen cover over the pipeline and in some instances may damage the pipeline itself. If such trails are to cross the pipeline rights-of-way, the trail owner should contact us to coordinate the installation of a crossing that will ensure there will be no impact to the earthen cover of the pipeline. How deep is the pipeline buried and what is done to prevent rusting, corrosion and other threats? The top of natural gas pipelines are required to be installed at least 36” below the ground’s surface when installed. The pipe has a special coating which protects the steel from corrosion and, in addition, a small amount of electrical current is applied to the pipeline to help prevent corrosion. This electrical current is maintained at a very low level that will not harm people or animals in the vicinity of the pipeline. We routinely inspect pipelines from above ground using air, foot, and vehicle patrols to look for potential concerns or encroachments along the right-of-way. With proper diligent maintenance and constantly improving operation and maintenance technology, pipelines made of steel can sustain their usefulness for an indefinite period. We continuously monitor and control the pressure at multiple points along our system. When pressures approach maximum acceptable levels, operators in the gas control center are alerted by electronic pressure transmitters placed throughout the system so that appropriate action can be taken. Our gas control and monitoring center operates 24-hours a day, seven-days-a-week. Maintenance of the remote transmitter system is conducted system-wide on a regular basis. What about pollution from leaking fuel tanks, heavy equipment, or other sources during construction? Construction activities are closely monitored to prevent and control fuel leaks and spills. All construction activities are regulated by federal and state agencies, and must have strict Spill Prevention, Control, and Countermeasure (SPCC) protocols in use. If you detect a natural gas odor, leave the area immediately and then call emergency personnel. If you suspect a pipeline leak, turn off and abandon any motorized equipment. Leave the area quickly. Warn others to stay away. From a safe place, call the pipeline operator and emergency personnel. Do not use open flames or anything that may spark ignition. Do not attempt to operate pipeline valves. ESNG and emergency personnel will assess the situation and take appropriate steps to secure the pipeline if a leak is discovered. What do you do in case of an emergency? Is there an Emergency Response Plan in place? Do you provide training to emergency responders? We have decades of experience working with local emergency responders along our pipeline corridors. We provide standard gas industry training for emergency responders to effectively prepare for and respond to natural gas emergency situations. This training is made available to emergency responders responsible for geographical areas in the ESNG facility footprint. Equipment/personnel requirements for responding to a natural gas emergency are similar in scope to normal emergency situations. An important role for the emergency responders is to secure a “safe perimeter” while ESNG personnel address the emergency situation. Do you have a strong safety record? Our safety record is exemplary thanks to the dedication of our employees and our commitment to the core values we espouse of safety, integrity, and community. Our gas control and monitoring center operates 24-hours a day, seven-days-a-week. We regularly patrol our pipeline rights-of-way and we conduct regular inspections of our pipeline system. Our operations employees receive regular training and are qualified under U.S. Department of Transportation standards for natural gas pipeline operators. ESNG operates the pipelines that deliver gas to local gas distribution companies. The distribution companies, in turn, deliver the gas to homes and businesses. If you desire natural gas service to your home, contact the gas distribution company in your area.